When you have a loved one cremated, there are countless ways you can dispose of the ashes left behind. People store them, scatter them, bury them, and put them on display. Some innovative companies even allow you to transform them into other types of objects, which range from records and diamonds to coral reefs. For most families, ashes are kept in an urn or other container to be placed on a shelf or mantle. Because urns can be costly (and not always necessary), urn alternatives tend to work just as well. 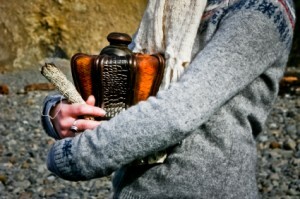 People tend to choose urns for several reasons. For one, they’re elegant and made of lasting materials, ranking them right up there with caskets in terms of display. They are also usually sealed tightly and are unbreakable—both a must if you have small children or pets who could upset the urn from a shelf. Cookie Jar: Was the deceased a baker? Do you have a whimsical cookie jar that captures something about the deceased (such as a cartoon character, flower, or other pretty design)? Cookie jars tend to be the right size to hold the ashes of a person, and many of them come with a clasped top to avoid spills. Handmade Boxes: Woodworkers and other craftsman can often make their own containers to hold ashes. (These can also be picked up at craft fairs.) Simple in design and lovely to look at, these can quickly become treasured family heirlooms. Beverage Decanter: Old-fashioned alcohol decanters usually come with stoppers, and tend to have enough volume to hold the ashes of a person. They also have the benefit of being see-through and elegantly designed. If the deceased was a lover of a good whisky, this could be a fitting way to display his or her ashes. An empty magnum of wine would also work for this. Vase or Other Open Container: There’s no rule that says your cremated remains have to be covered at all. A large vase works well to hold and display ashes, especially if you’d like to turn it into a showpiece. Mixing the ashes with colorful marbles or rocks, seashells, and other non-perishables and putting them on a bathroom counter provides a lovely touch. Smaller containers can also work if you’re willing to divide the ashes (or if you need to divide them to share with multiple relatives). Mason jars, beer steins, single flower vases, and other receptacles can work for this purpose. Displaying the ashes of a loved one doesn’t have to be costly. If you don’t mind getting creative and you’re willing to expose the ashes to the air, you have an almost unlimited number of burial and display options. can uou use your own urn?